Thalassotherapy is an ancient therapeutic self-care approach and traditional medicine that utilizes ocean water/sea vegetation, biomimicry/environmental solutions, and marine ingredients to directly affect long-term beauty. Seaweeds are the vegetation of the ocean, it spends its lifetime floating in the sea soaking up its surroundings. It is a mineral sponge full of slippery polysaccharides that are a gelatin chalked full of iodine (antioxidant), botanical hormones, lipids, natural hyaluronic acid, peptides, fucoidan, fucoxanthin and many other beneficial derivatives. When applied to skin the slippery gel facilitates self-regulation of cellular activities include: recharge mitochondria energy, restore orderly cell death/propagation, manage DNA repair mechanisms and improve protein synthesis. It is both a growth medium and a cleansing agent. This all happens while in the background it is also fortifying cellular defense mechanisms (Klotho, NAD+, AMPT) through calorie restriction mimicking. Although the practice of Thalassotherapy is ancient, the scientific study of of it’s efficacy has been a popular subject for centuries as well. Dr. Richard Russell, whom many consider to be the founder of modern-day Thalassotherapy, validated the efficacy of seawater for health maintenance in the 1700s when he penned A Dissertation Concerning the use of Seawater in Curing Diseases of the Glands. Dr. Rene Quinton later found in the 1800’s that seawater closely mimics our own extra-cellular fluid; our blood serum is a saltier copy and amniotic fluid is an exact replica. 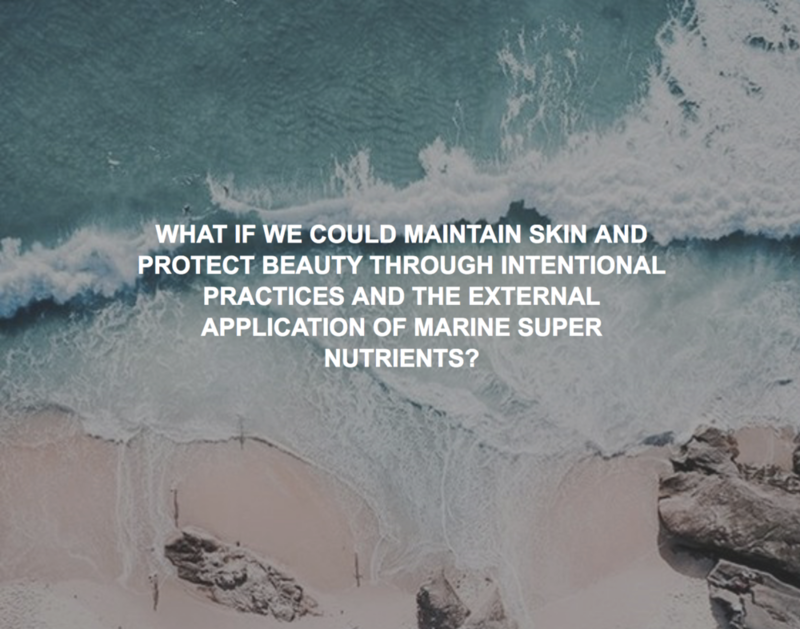 Current research validates these claims and goes on to further show that marine macroalgae (seaweeds) offer a potent blend of bioidentical compounds incredible for skin maintenance and cellular rejuvenation, assimilating up to 78 minerals and trace elements back into the dermal system to improve mineral in-balances and restore homeostasis. Simply put, seaweed clears toxins, increases blood flow and improves circulation. This cycle removes inflammation, evens tone and clears anti-aging pathways. A balanced diet of marine nutrients applied to skin it can positively and noticeably affect the look and feel of your exterior. We believe that health and wellness should belong to the many, rather than the few. Beauty is a simple luxury that everyone should have within their grasp. Direct from the coast of California, mindfully hand-crafted with loving care and intelligently packaged. We want to help you immerse yourself in the sea, no matter where you are. Ama bottles the power of the Pacific with an affordable line of limited ingredient, natural, organic products that put the wild of the sea and the power of beauty maintenance directly in your hands through home ThalassoTherapy practices. Experience our exquisite line of ocean products that deliver remarkable results with simple marine solutions. A naturally colored blend of two sea salts and a pinch of Red Snow Algae (innovative ingredient winner 2014). SeaMist is a shot of sea and a pick me up toner for tired and dull skin. · Use alone, mist morning and evening or anytime your skin feels tired and dull. · Use before VitaSea for easy application and extra slip. · Use before DeepSea for easy application and extra slip. · Use after makeup application to set make-up, repeat throughout the day to recharge your look. · Use after SeaGlow to remove any extra slick feeling and to prepare face for make-up. · Use after SeaScrub to remove any extra slick feeling. · Mist in Hair for extra bounce. · Mist on neck, back of hands and décolleté’ to heal sun damage and prevent premature aging. · All Ama products were developed for the face but are beneficial for the entire body. A blend of two seaweed extracts and a pinch of Red Snow Algae, colored with Blue Pea Flower, and a fresh scent. This serum has minimal ingredients that are hand harvested for freshness. · Apply 2 – 3 pumps of VitaSea to moist (or apply SeaMist first) face/neck/décolleté/back of hands. This allows for easy application and greater slip. No need to rinse – apply makeup directly over VitaSea. · For greater moisture add 1 or 2 pumps of SeaGlo to VitaSea and apply the two together. No need to rinse. · Apply After SeaScrub – No need to rinse. · Apply after bathing with Ama Sea Beauty SeaTea. No need to rinse. · Mask (hand, neck, decolete) – Apply liberally to a moist face (apply SeaMist first). Slip in the bath with SeaTea. Rinse face in the tub. · Set make-up: Add two pumps to palms. Rub evenly in hands and pat over the top of finished makeup. Mist with SeaMist and get your day on! A rich concentrated blend of red/brown CA native seaweeds colored with Blue Pea Flower. This product was developed for troubled skin, chronic conditions, spot treatment or an intense overnight mask. This product is as effective as a pro-lift and Botox replacement. · Apply small amounts to spots of concern or directly on breakouts. · Mask: Mist face with SeaMist then apply a liberal amount of DeepSea. Allow to dry for 20 minutes and wash off or apply as an overnight leave on mask. Next morning mist with SeaMist to rehydrate and massage face for a few minutes before rinsing. Best if rinsed off in a bath/shower. · Extra moisture: add 1-2 pump/s of SeaGlo and apply both together. · SeaScrub mask: combine equal amounts of DeepSea and SeaScrub in your palm. Apply to face, sit back and relax, after 20 minutes massage face with wet hands to exfoliate and rinse before exiting the tub. · SeaGlo Mask: Apply a thick layer of DeepSea allow to partially dry, pat on 1-2 pump/s of SeaGlo. Sit by a sunny window and allow to dry. Rinse. · Makeup lift: Cover face/neck with a thin layer before make-up and after applying makeup pat on 1-2 pumps. Repeat throughout the day. · Hand mask: Apply a thick layer of DeepSea on back of hands and allow to dry. Rinse and apply VitaSea. Micro Algae Oil is fragrance free. Skip the fish oil and go for the seaweed, it’s not the fish > it’s what the fish eat! Dermal omegas for a radiant Glo. · Apply 1 – 3 pumps to face/neck/décolleté/hands anytime you feel you need extra moisture. · Hair: apply to scalp and ends to prevent premature hair loss, improve the sheen and reduce breakage. · Nails: apply to hands and feet to prevent cracks and chips. · For extra tightening: add 1 – 2 pumps of DeepSea to SeaGlo in your palm, and apply together. Two sea salts, a red/brown native CA seaweeds, Algae Oil and Blue Pea Flower. SeaScrub is a gentle exfoliator that clears toxins and stimulates cellular activity. SeaScrub delivers natural minerals and trace essential elements. This product comes with a natural abalone shell (scooper) from a local abalone farm. The shells used in our products were simply out grown. No animals were harmed in the harvesting of any of our products. This product is best used over a sink or in the bathtub. If you prefer to skip the soap SeaScrub is an excellent once a day face cleanser that gently removes make-up and dirt. · Scoop appropriate amount in moist hands and apply to moist face (this will prevent crumbling and mess). Massage into face, neck, décolleté and back of hands. Rinse and mist with SeaMist to remove excess oil. · For a DeepSea mask. Sea above! This is our sea beauty bath that offers a simple beauty solution beyond the face. Salt, red/brown native whole seaweeds, a mild surfactant and Blue Pea Flowers create a luxurious home crafted marine environment that wakes up beauty! Our beauty bath can help you love the skin you’re in! SeaTea creates rich lather and it naturally colors the water ocean blue. 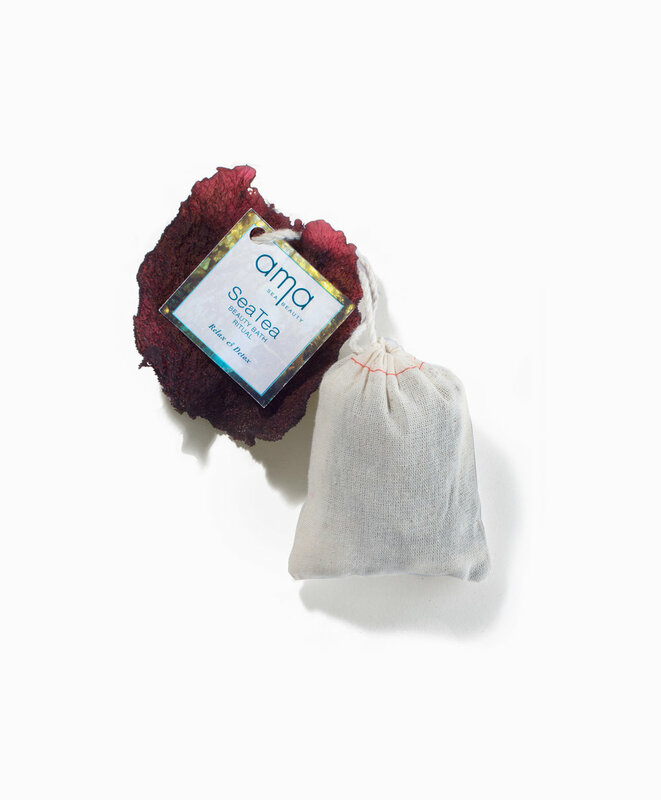 SeaTea comes with a whole fresh piece of Turkish Towel seaweed. Once your bag is wet the Turkish Towel will rehydrate, rip-off “towel” from the bath bag string and use to exfoliate and wash the entire body. Hang your washcloth to dry and reuse again and again. · Drop a SeaTea bag in the tub as it fills. Once in the tub rub the bag on the entire body to distribute the foamy sea gel all over your skin. After use hang on spigot or in a sunny window to dry. If allowed to dry in-between uses, the bag can be used 5-8 times. If the seaweed smells sour it should be disposed of. SeaTea will only create color and lather on the first use. When you are ready to dispose, dump contents in your compost bin and wash/repurpose bag. · SeaTea makes a great shaving buddy no matter where you are shaving. Rub on skin before shaving to add slip and skip the soap. In keeping with our commitment to develop eco products, Ama will soon offer a water free powder face cleanser, powder mask, SeaScrub refill, and a UV marine finishing powder. We are devoted to the creation of products that are as good for the planet as they are for people. Engaging in Ama is no different that switching up your diet or adopting a new workout routine. Slow and steady is always the best way to start anything new. Education, experimentation and implementation will help you move into a ThalassoTherapy lifestyle that adds longevity, beauty, and graceful aging into a new wellness model. Let Ama help you Sea a new way to age with and AMAzing grace!